As thousands of National Guard troops deploy to the Mexico border, U.S. Attorney General Jeff Sessions plans to bring his firm stance on immigration enforcement to New Mexico where a group of Southwest border sheriffs are meeting Wednesday. Sessions will speak in Las Cruces at the Texas Border Sheriff's Coalition Annual Spring Meeting with the Southwestern Border Sheriff's Coalition, which is made up of 31 sheriff's departments from Texas, New Mexico, Arizona and California. Their counties are located within 25 miles (40 kilometers) of the U.S.-Mexico border. Immigrant rights activists promised to protest Sessions' visit on Wednesday, as they rejected his past characterization of the border region during a 2017 visit to El Paso, Texas, as "ground zero'' in the Trump administration's fight against cartels, and human traffickers. El Paso is some 50 miles (80 kilometers) south of Las Cruces. 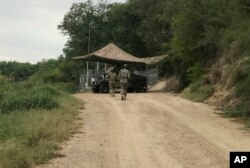 U.S. National Guard troops guard the border in Roma, Texas, April 10, 2018. Sessions' trip to Las Cruces, a city about an hour north of the border, comes as construction begins nearby on 20-miles (32-kilometers) of steel fencing that officials say is a part of President Donald Trump's promised wall. U.S. Customs and Border Protection officials have described the new, heightened barrier as a structure that will be harder to get over, under and through than the old post and rail barriers that has lined the stretch of the border's El Paso sector. Sessions has issued an order directing federal prosecutors to put more emphasis on charging people with illegal entry, citing a ``crisis'' on the border. A 37 percent increase in illegal border crossings in March brought more than 50,000 immigrants into the United States, which was triple the number of reported illegal border crossings in the same period last year. It was still far lower, however, than the surges during the last years of the Obama administration and prior decades. The attorney general's "zero-tolerance'' for border-crossing prosecutions calls for taking action against people who are caught illegally entering the United States for the first time. In the past, such offenses have been treated as misdemeanors. He also recently set quotas for immigration judges to reduce enormous court backlogs, saying they must complete 700 cases a year to earn a satisfactory grade. The quotas take effect Oct. 1.